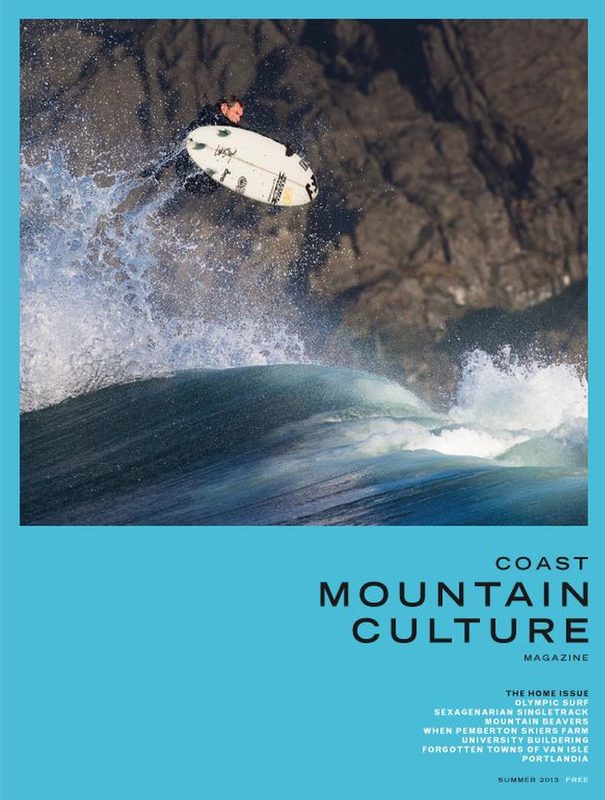 In the winter, I interviewed Louis-Phillipe Leonard, co-founder and marketing manager for Leon Lebeniste, for an article in about-to-land Coast Mountain Culture magazine. Now that summer’s here, and I’m man-handling my bike onto its wall hooks in the garage after every ride, I’m coveting their signature bike rack even more. Here’s the story behind it. Jon and I had always dreamt of doing Leon Lebeniste in BC someday, though I had taken a couple years in a different direction from Leon Lebeniste and was starting a new career in TV hosting in Montreal. Jon had shipped all the machinery out to Squamish and set up shop there. He called me from BC and told me to come for a few days and even offered to pay for the flight. He said: Come. If you like it, you stay. If you don’t, go back and do the TV hosting in Montreal. It took me 3 days to realize that Squamish was the best place in the world. I decided to stay and that was the best decision I ever made. The story behind those racks – after moving to BC to room with Jon we ended up renting a new place in Amblepath. The landlord, when we visited, was pointing our each little tiny scratch on the walls from the previous tenant and was asking us to sign everywhere on the lease so that we’d be responsible for any new damage..
After that, owning 4 bikes myself, Jon 2, skiis and snowboards (all leaning against the walls), I was like, how am I gonna do this without ever scratching anything. So then I thought, Okay, I have access to the coolest woodworking tools in the world… Let’s make a bike rack. Lots of hanging on both side for gear and equipment so you’re not looking for your helmet of pads all the time when it’s time to go for a ride, it helps drying wet equipment and keeps everything off the ground. So it started that way. I made a few prototypes and improved all kind of details on it and I can say that they work really well now. Usually when I explain all these details, people look at me and say that’s very smart. The bike racks are cut with the CNC machine. 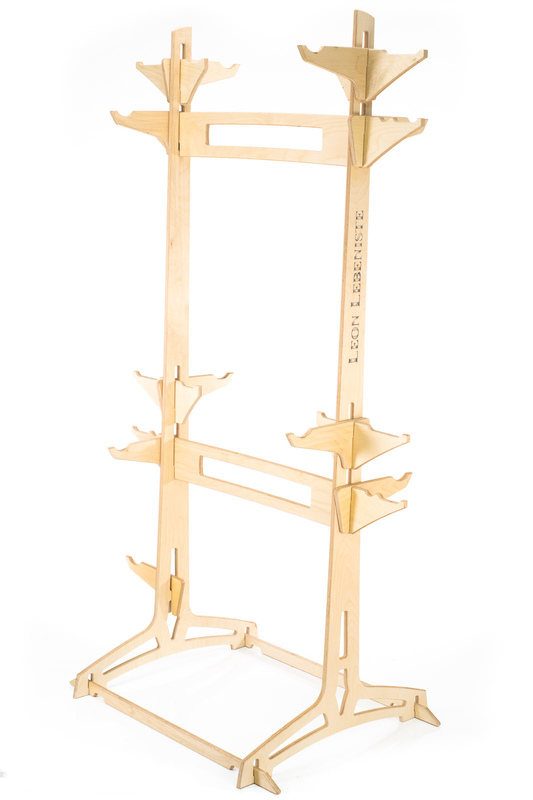 We’re on to the 9th version of the original bike stand. I would say, especially for “LE GARDE” our most popular one that is made for 4 bikes front loading, there’s maybe 150 hours of design time in it. The bike gurus at pinkbike tested it thoroughly. Check out their review, here. 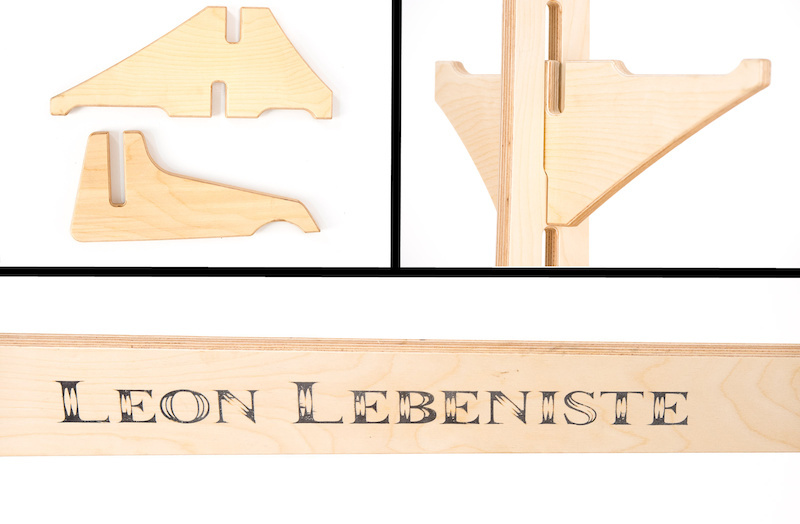 As well as feedback from happy customers at the Leon Lebeniste e-store. nice one sunshine, it’s a pity I have 5 bikes, 5 surfboards, 2 wakeboards, 2 kiteboards, 1 kite surfboard, kayak and heaps of kids gear. have anything for that?